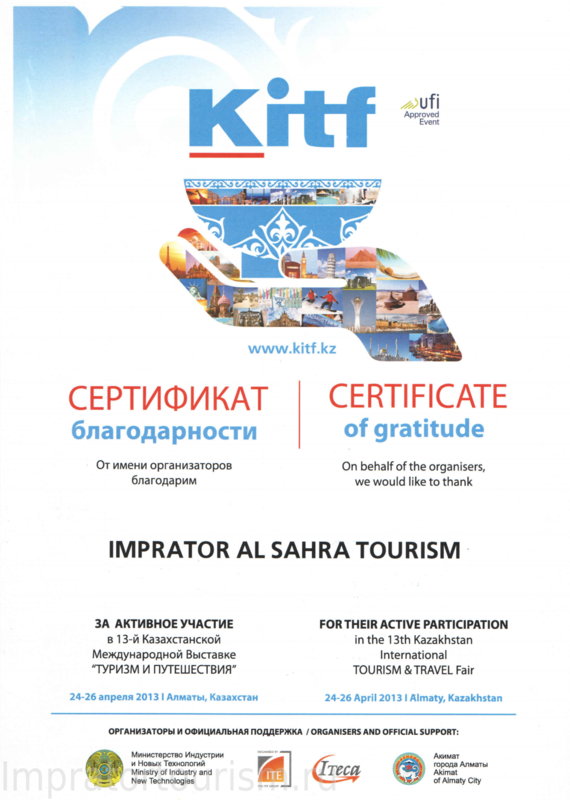 Start your vacation with Imprator Al Sahra Tourism! Best rates for excursions in UAE! We can guarantee your good mood! If you buy 3 of any of our tours you will get Dubai City Tour from our company FREE! The story of Imprator Al Sahra Tourism company success has begun in 1998. It was found by the group of professionals, who had a long-term experience in tourist market. Our main goal is to provide the memorable and comfortable trip via UAE. We’ll help you to organize your vocation or a business trip around UAE. You will appreciate the professional competence of our team at its true value. We will help you to see the best places in UAE and we will do all our best to make your staying bright and colorful. We are sure you will take away only fascinating memories and positive impression. Our company specializes on incoming tourist groups and arranging city trips around the country. - organization of commercial and introductory trips for travel agencies’ management to rise up the number of customers and to support the interest to the country. If you can’t find the information you need through this list of services, our staff will consult you at your point with a great pleasure. For 14 years of working on tourism market, we could find our own business style of working with the customers. According to permanent customers growth we can make a conclusion that we are professionals. It’s impossible to have a success without possessing of corporate culture, high service quality and professionalism. We are always ready to cooperate. We respect our partners’ and competitors’ opinion. The market competition is a stimulus for us for further growth. We work with hotels and arrange trips directly, without mediators so that allows us to offer reasonable prices and make up documents in short terms. We have all necessary license and insurance. We cooperate only with reliable partners. The relationship with our partners is based on a long-term and a mutually beneficial basis that is why all our partners are friends. As we are located in the UAE we can solve all the tasks efficiently. We reply by email, telephone and skype immediately. We take care about you by fulfilling all commitments and we are responsible at every step of our cooperation. We value your confidence and our reputation so we are honest with our customers and keep all the confidential information between our company and you. We are always in touch with the UAE events and ready to make all your bold dreams come true by working out new routes to the unexplored parts of the UAE. a huge love for the UAE, all these facts allow us to guarantee the high level service and twenty-four- hour support to our customers. A long-term experienced staff, exclusive entertainment programs and creative approach will satisfy even the most exacting customer. Every detail of your vocation is important to us. We pay much attention to planning and execution, quality control at every step of working process.